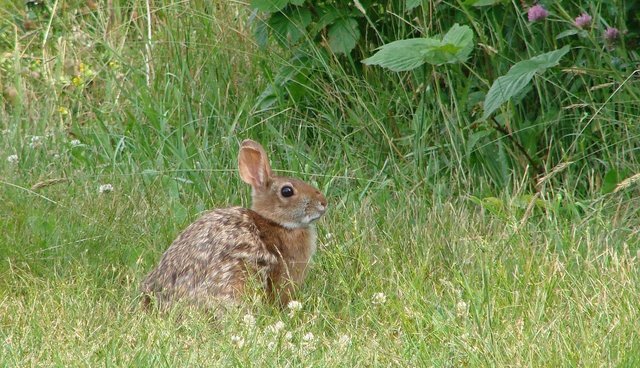 The New England cottontail -- one of the rarest rabbits in the country -- is in danger of losing habitats in Maine and New Hampshire. A group of scientists have identified areas that are critical to the rabbits' long-term survival and are calling on wildlife management to protect these new-found bunny corridors. To thrive, cottontails need thickets, a scrubby environment that's not quite field or forest, filled with shrubs and small trees. "A lot of other species rely on these thicket habitats, including bobcats, birds, and reptiles," says University of New Hampshire ecologist Adrienne Kovach. "Many thicket-dependent species are on decline, and the New England cottontail is a representative species for this kind of habitat and its conservation." To figure out where the bunnies travel, Kovach and her colleagues analyzed the genes of 157 rabbits (by extracting DNA from the bunnies' droppings), encompassing four different cottontail populations. Comparing DNA between groups, the ecologists could track gene flow, the movement of genetic information that reflects where bunnies move and breed. Highways and rivers, as you might imagine, don't make good bunny boulevards. But the scrubland along less-busy streets, next to railroad tracks and beneath power lines, it turns out, are crucial corridors where cottontails travel, as the scientists report in the journal of Ecology and Evolution. The researchers hope that wildlife managers and conservationists will focus on these landscapes that offer the greatest boon to bunnies. "If we can restore more of this habitat in our landscape and work on creating a landscape that has a mosaic of different habitats, including mature forests and young forests," Kovach says, "we know that it is going to help a lot of species."